Three non-fiction books and two poems have been published posthumously. One novel has been published posthumously and another, an unusual collaboration, was published in 2006. Four collections have been published posthumously. Heinlein's fictional works can be found in the library under PS3515.E288, or under Dewey 813.54. Known pseudonyms include Anson MacDonald (7 times), Lyle Monroe (7), John Riverside (1), Caleb Saunders (1), and Simon York (1). All the works originally attributed to MacDonald, Saunders, Riverside and York, and many of the works originally attributed to Lyle Monroe, were later reissued in various Heinlein collections and attributed to Heinlein. Novels marked with an asterisk * are the Scribner's "juvenile" series. On February 1, 2019, Phoenix Pick announced that through a collaboration with the Heinlein Prize Trust, a reconstruction of the full text of an unpublished Heinlein novel had been produced. The reconstructed novel, tentatively entitled 666 was an alternative version of The Number of the Beast, with the first one-third of 666 mostly the same as the first one-third of The Number of the Beast but the remainder of 666 deviating entirely from The Number of the Beast, with a completely different story-line. The newly reconstructed novel pays homage to Edgar Rice Burroughs and E. E. "Doc" Smith. The reconstructed novel 666 is currently being edited by Patrick LoBrutto. Both 666 and a new edition of The Number of the Beast are planned to be published in the fourth quarter of 2019. "If This Goes On—", 1940, first novel. 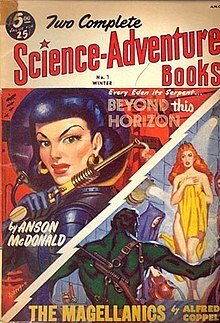 All the works initially attributed to Anson MacDonald, Caleb Saunders, John Riverside and Simon York, and many of the works attributed to Lyle Monroe, were later reissued in various Heinlein collections and attributed to Heinlein. At Heinlein's insistence, the three Lyle Monroe stories marked with the symbol '§' were never reissued in a Heinlein anthology during his lifetime. The Virginia Edition, a 46-volume hardcover collection of all of Robert Heinlein's stories, novels, and nonfiction writing, plus a selection of his personal correspondence, was announced by Meisha Merlin Publishing in April 2005; the Robert A. and Virginia Heinlein Prize Trust (which now owns the Heinlein copyrights) instigated the project. Meisha Merlin went out of business in May 2007 after producing six volumes: I Will Fear No Evil, Time Enough for Love, Starship Troopers, For Us, the Living, The Door into Summer, and Double Star. The Heinlein Prize Trust then decided to publish the edition itself, having formed the Virginia Edition Publishing Co. for this purpose. As was true for the Meisha Merlin effort, individual volumes are not offered; subscribers must purchase the entire 46-volume set. The final five volumes (including two volumes of screenwriting, both produced and unproduced) were shipped to subscribers in June 2012. In July 2007, the Heinlein Prize Trust opened the online Heinlein Archives, which allows people to purchase and download items from the Heinlein Archive previously stored at the University of California-Santa Cruz. The Trust makes grants available to those using the archives for scholarly purposes. 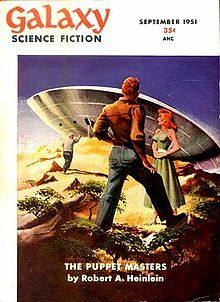 Tomorrow, the Stars, 1952, anthology of stories by 14 authors selected by Frederik Pohl and Judith Merril, foreword by Heinlein who got his name on the cover. Two articles for Encyclopædia Britannica on Paul Dirac and antimatter, and on blood chemistry. "Spinoff", an article about the commercialization of inventions created for NASA and the American space program, published in Omni magazine, 1980; reprinted in Expanded Universe. 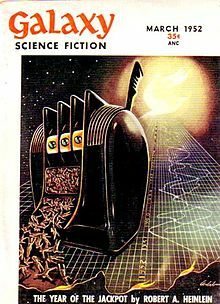 Dimension X, science fiction radio programs in 1950–1951. Among other writers, episodes were based on Heinlein's Destination Moon (film) (ep. 12), The Green Hills of Earth (ep. 10), Requiem, The Roads Must Roll, and Universe. Language arts materials for teachers based on Heinlein's works, in support of World Space Week, 2005. ^ James Gifford (29 March 2005). "The Robert A. Heinlein Frequently Asked Questions List (FAQ)". Retrieved 17 February 2015. ^ "1956 Award Winners & Nominees". Worlds Without End. Retrieved 2009-03-29. ^ "1959 Award Winners & Nominees". Worlds Without End. Retrieved 2009-03-29. ^ "1960 Award Winners & Nominees". Worlds Without End. Retrieved 2009-03-29. ^ "1962 Award Winners & Nominees". Worlds Without End. Retrieved 2009-03-29. ^ "1964 Award Winners & Nominees". Worlds Without End. Retrieved 2009-03-29. ^ "1967 Award Winners & Nominees". Worlds Without End. Retrieved 2009-03-29. ^ "1973 Award Winners & Nominees". Worlds Without End. Retrieved 2009-05-03. ^ "1974 Award Winners & Nominees". Worlds Without End. Retrieved 2009-03-29. ^ "1983 Award Winners & Nominees". Worlds Without End. Retrieved 2009-03-29. ^ "1984 Award Winners & Nominees". Worlds Without End. Retrieved 2009-05-03. ^ "1985 Award Winners & Nominees". Worlds Without End. Retrieved 2009-03-29. ^ "A New Robert A. Heinlein Book to be Published Based on Newly Recovered Manuscript" (Press release). Phoenix Pick. Retrieved 23 March 2019. ^ Bill Patterson (2000). "A Study of 'If This Goes On—'". The Heinlein Journal (7). ^ Encyclopædia Britannica articles: on Paul Dirac and antimatter, and on blood chemistry. A version of the former, titled "Paul Dirac, Antimatter, and You," was published in the anthology Expanded Universe; an afterword gives a normalization equation and presents it, incorrectly as being the Dirac equation. The Heinlein Society and their FAQ. Good bibliography, essays, news, links, etc. This page was last edited on 23 March 2019, at 08:12 (UTC).